Technetium-99m is a metastable nuclear isomer of technetium-99 (itself an isotope of technetium), symbolized as 99mTc, that is used in tens of millions of medical diagnostic procedures annually, making it the most commonly used medical radioisotope. The first technetium-99m generator, 1958. Technetium-99m is used as a radioactive tracer and can be detected in the body by medical equipment (gamma cameras). It is well suited to the role, because it emits readily detectable gamma rays with a photon energy of 140 keV (these 8.8 pm photons are about the same wavelength as emitted by conventional X-ray diagnostic equipment) and its half-life for gamma emission is 6.0058 hours (meaning 93.7% of it decays to 99Tc in 24 hours). The relatively "short" physical half-life of the isotope and its biological half-life of 1 day (in terms of human activity and metabolism) allows for scanning procedures which collect data rapidly but keep total patient radiation exposure low. The same characteristics make the isotope suitable only for diagnostic but never therapeutic use. Technetium-99m was discovered as a product of cyclotron bombardment of molybdenum. This procedure produced molybdenum-99, a radionuclide with a longer half-life (2.75 days), which decays to Tc-99m. At present, molybdenum-99 (Mo-99) is used commercially as the easily transportable source of medically used Tc-99m. In turn, this Mo-99 is usually created commercially by fission of highly enriched uranium in aging research and material testing nuclear reactors in several countries. we discovered an isotope of great scientific interest, because it decayed by means of an isomeric transition with emission of a line spectrum of electrons coming from an almost completely internally converted gamma ray transition. [actually, only 12% of the decays are by internal conversion] (...) This was a form of radioactive decay which had never been observed before this time. Segrè and I were able to show that this radioactive isotope of the element with the atomic number 43 decayed with a half-life of 6.6 h [later updated to 6.0 h] and that it was the daughter of a 67-h [later updated to 66 h] molybdenum parent radioactivity. This chain of decay was later shown to have the mass number 99, and (...) the 6.6-h activity acquired the designation ‘technetium-99m. Later in 1940, Emilio Segrè and Chien-Shiung Wu published the experimental results of the analysis of fission products of uranium-235, among which was present molybdenum-99, and detected the 6-h activity of element 43, later labelled as technetium-99m. 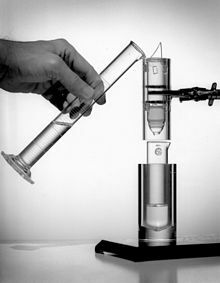 Tc-99m remained a scientific curiosity until the 1950s when Powell Richards realized the potential of technetium-99m as a medical radiotracer and promoted its use among the medical community. While Richards was in charge of the radioisotope production at the Hot Lab Division of the Brookhaven National Laboratory, Walter Tucker and Margaret Greene were working on how to improve the separation process purity of the short-lived eluted daughter product iodine-132 from tellurium-132, its 3.2-days parent, produced in the Brookhaven Graphite Research Reactor. They detected a trace contaminant which proved to be Tc-99m, which was coming from Mo-99 and was following tellurium in the chemistry of the separation process for other fission products. Based on the similarities between the chemistry of the tellurium-iodine parent-daughter pair, Tucker and Greene developed the first technetium-99m generator in 1958. It was not until 1960 that Richards became the first to suggest the idea of using technetium as a medical tracer. The first US publication to report on medical scanning of Tc-99m appeared in August 1963. Sorensen and Archambault demonstrated that intravenously injected carrier-free Mo-99 selectively and efficiently concentrated in the liver, becoming an internal generator of Tc-99m. After build-up of Tc-99m, they could visualize the liver using the 140 keV gamma ray emission. The production and medical use of Tc-99m rapidly expanded across the world in the 1960s, benefiting from the development and continuous improvements of the gamma cameras. Between 1963 and 1966, numerous scientific studies demonstrated the use of Tc-99m as radiotracer or diagnostic tool. As a consequence the demand for Tc-99m grew exponentially and by 1966, Brookhaven National Laboratory was unable to cope with the demand. Production and distribution of Tc-99m generators were transferred to private companies. "TechneKow-CS generator", the first commercial Tc-99m generator, was produced by Nuclear Consultants, Inc. (St. Louis, Missouri) and Union Carbide Nuclear Corporation (Tuxedo, New York). From 1967 to 1984, Mo-99 was produced for Mallinckrodt Nuclear Company at the Missouri University Research Reactor (MURR). Union Carbide actively developed a process to produce and separate useful isotopes like Mo-99 from mixed fission products that resulted from the irradiation of highly enriched uranium (HEU) targets in nuclear reactors developed from 1968 to 1972 at the Cintichem facility (formerly the Union Carbide Research Center built in the Sterling forest in Tuxedo, New York (41°14′6.88″N 74°12′50.78″W﻿ / ﻿41.2352444°N 74.2141056°W﻿ / 41.2352444; -74.2141056)). The Cintichem process originally used 93% highly enriched U-235 deposited as UO2 on the inside of a cylindrical target. At the end of the 1970s, 200,000 Ci (7.4×1015 Bq) of total fission product radiation were extracted weekly from 20-30 reactor bombarded HEU capsules, using the so-called "Cintichem [chemical isolation] process." The research facility with its 1961 5-MW pool-type research reactor was later sold to Hoffman-LaRoche and became Cintichem Inc. In 1980, Cintichem, Inc. began the production/isolation of Mo-99 in its reactor, and became the single U.S. producer of Mo-99 during the 1980s. However, in 1989, Cintichem detected an underground leak of radioactive products that led to the reactor shutdown and decommissioning, putting an end to the commercial production of Mo-99 in the USA. The production of Mo-99 started in Canada in the early 1970s and was shifted to the NRU reactor in the mid 1970s. By 1978 the reactor provided technetium-99m in large enough quantities that were processed by AECL's radiochemical division, which was privatized in 1988 as Nordion, now MDS Nordion. In the 1990s a substitution for the aging NRU reactor for production of radioisotopes was planned. The Multipurpose Applied Physics Lattice Experiment (MAPLE) was designed as a dedicated isotope-production facility. Initially, two identical MAPLE reactors were to be built at Chalk River Laboratories, each capable of supplying 100% of the world's medical isotope demand. However, problems with the MAPLE 1 reactor, most notably a positive power co-efficient of reactivity, led to the cancellation of the project in 2008. The first commercial Tc-99m generators were produced in Argentina in 1967, with Mo-99 produced in the CNEA's RA-1 Enrico Fermi reactor. Besides its domestic market CNEA supplies Mo-99 to some South American countries. In 1967, the first Tc-99m procedures were carried out in Auckland, New Zealand. Mo-99 was initially supplied by Amersham, UK, then by the Australian Nuclear Science and Technology Organisation (ANSTO) in Lucas Heights, Australia. In May 1963, Scheer and Maier-Borst were the first to introduce the use of Tc-99m for medical applications. In 1968, Philips-Duphar (later Mallinckrodt, today Covidien) marketed the first technetium-99m generator produced in Europe and distributed from Petten, the Netherlands. Global shortages of technetium-99m emerged in the late 2000s because two aging nuclear reactors (NRU and HFR) that provided about two-thirds of the world’s supply of molybdenum-99, which itself has a half-life of only 66 hours, were shut down repeatedly for extended maintenance periods. In May 2009 the Atomic Energy of Canada Limited announced the detection of a small leak of heavy water in the NRU reactor that remained out of service until completion of the repairs in August 2010. After the observation of gas bubble jets released from one of the deformations of primary cooling water circuits in August 2008, the HFR reactor was stopped for a thorough safety investigation. NRG received in February 2009 a temporary license to operate HFR only when necessary for medical radioisotope production. HFR stopped for repairs at the beginning of 2010 and was restarted in September 2010. Two replacement Canadian reactors (see MAPLE Reactor) constructed in the 1990s were closed before beginning operation, for safety reasons. A construction permit for a new production facility to be built in Columbia, MO was issued in May 2018. Technetium-99m is a metastable nuclear isomer, as indicated by the "m" after its mass number 99. This means it is a decay product whose nucleus remains in an excited state that lasts much longer than is typical. The nucleus will eventually relax (i.e., de-excite) to its ground state through the emission of gamma rays or internal conversion electrons. Both of these decay modes rearrange the nucleons without transmuting the technetium into another element. Tc-99m decays mainly by gamma emission, slightly less than 88% of the time. (99mTc → 99Tc + γ) About 98.6% of these gamma decays result in 140.5 keV gamma rays and the remaining 1.4% are to gammas of a slightly higher energy at 142.6 keV. These are the radiations that are picked up by a gamma camera when 99mTc is used as a radioactive tracer for medical imaging. The remaining approximately 12% of 99mTc decays are by means of internal conversion, resulting in ejection of high speed internal conversion electrons in several sharp peaks (as is typical of electrons from this type of decay) also at about 140 keV (99mTc → 99Tc+ + e−). These conversion electrons will ionize the surrounding matter like beta radiation electrons would do, contributing along with the 140.5 keV and 142.6 keV gammas to the total deposited dose. Pure gamma emission is the desirable decay mode for medical imaging because other particles deposit more energy in the patient body (radiation dose) than in the camera. Metastable isomeric transition is the only nuclear decay mode that approaches pure gamma emission. Tc-99m's half-life of 6.0058 hours is considerably longer (by 14 orders of magnitude, at least) than most nuclear isomers, though not unique. This is still a short half-life relative to many other known modes of radioactive decay and it is in the middle of the range of half lives for radiopharmaceuticals used for medical imaging. After gamma emission or internal conversion, the resulting ground-state technetium-99 then decays with a half-life of 211,000 years to stable ruthenium-99. This process emits soft beta radiation without a gamma. Such low radioactivity from the daughter product(s) is a desirable feature for radiopharmaceuticals. The parent nuclide of Tc-99m, Mo-99, is mainly extracted for medical purposes from the fission products created in neutron-irradiated U-235 targets, the majority of which is produced in five nuclear research reactors around the world using highly enriched uranium (HEU) targets. Smaller amounts of 99Mo are produced from low-enriched uranium in at least three reactors. Nuclear reactors producing 99Mo from U-235 targets. The year indicates the date of the first criticality of the reactor. Production of 99Mo by neutron activation of natural molybdenum, or molybdenum enriched in Mo-98, is another, currently smaller, route of production. The feasibility of Tc-99m production with the 22-MeV-proton bombardment of a Mo-100 target in medical cyclotrons was demonstrated in 1971. The recent shortages of Tc-99m reignited the interest in the production of "instant" 99mTc by proton bombardment of isotopically enriched Mo-100 targets (>99.5%) following the reaction 100Mo(p,2n)99mTc. Canada is commissioning such cyclotrons, designed by Advanced Cyclotron Systems, for Tc-99m production at the University of Alberta and the Université de Sherbrooke, and is planning others at the University of British Columbia, TRIUMF, University of Saskatchewan and Lakehead University. Other particle accelerator-based isotope production techniques have been investigated. The supply disruptions of Mo-99 in the late 2000s and the aging of the producing nuclear reactors forced the industry to look into alternative methods of production. The use of cyclotrons to produce Mo-99 from Mo-100 via (n,2n) or (γ,n) reactions has been further investigated. Technetium-99m's short half-life of 6 hours makes storage impossible and would make transport very expensive. It is instead its parent nuclide 99Mo is supplied to hospitals after its extraction from the neutron-irradiated uranium targets and its purification in dedicated processing facilities. [notes 1]  It is shipped by specialised radiopharmaceutical companies in the form of technetium-99m generators worldwide or directly distributed to the local market. The generators, colloquially known as a moly cows, are devices designed to provide radiation shielding for transport and to minimize the extraction work done at the medical facility. A typical dose rate at 1 metre from Tc-99m generator is 20-50 μSv/h during transport. These generators' output declines with time and must be replaced weekly, since the half-life of 99Mo is still only 66 hours. electrons are easily shielded for transport, and 99mTc generators are only minor radiation hazards, mostly due to secondary X-rays produced by the electrons (also known as Bremsstrahlung). At the hospital, the 99mTc that forms through 99Mo decay is chemically extracted from the technetium-99m generator. Most commercial 99Mo/99mTc generators use column chromatography, in which 99Mo in the form of water-soluble molybdate, MoO42− is adsorbed onto acid alumina (Al2O3). When the 99Mo decays, it forms pertechnetate TcO4−, which, because of its single charge, is less tightly bound to the alumina. Pulling normal saline solution through the column of immobilized 99MoO42− elutes the soluble 99mTcO4−, resulting in a saline solution containing the 99mTc as the dissolved sodium salt of the pertechnetate. One technetium-99m generator, holding only a few micrograms of 99Mo, can potentially diagnose 10,000 patients because it will be producing 99mTc strongly for over a week. Technetium exits the generator in the form of the pertechnetate ion, TcO4−. The oxidation state of Tc in this compound is +7. This is directly suitable for medical applications only in bone scans (it is taken up by osteoblasts) and some thyroid scans (it is taken up in place of iodine by normal thyroid tissues). In other types of scans relying on Tc-99m, a reducing agent is added to the pertechnetate solution to bring the oxidation state of the Tc down to +3 or +4. Secondly, a ligand is added to form a coordination complex. The ligand is chosen to have an affinity for the specific organ to be targeted. For example, the exametazime complex of Tc in oxidation state +3 is able to cross the blood–brain barrier and flow through the vessels in the brain for cerebral blood flow imaging. Other ligands include sestamibi for myocardial perfusion imaging and mercapto acetyl triglycine for MAG3 scan to measure renal function. In 1970, Eckelman and Richards presented the first "kit" containing all the ingredients required to release the Tc-99m, "milked" from the generator, in the chemical form to be administered to the patient. Technetium-99m is used in 20 million diagnostic nuclear medical procedures every year. Approximately 85% of diagnostic imaging procedures in nuclear medicine use this isotope as radioactive tracer. Klaus Schwochau's book Technetium lists 31 radiopharmaceuticals based on 99mTc for imaging and functional studies of the brain, myocardium, thyroid, lungs, liver, gallbladder, kidneys, skeleton, blood, and tumors. Depending on the procedure, the 99mTc is tagged (or bound to) a pharmaceutical that transports it to its required location. For example, when 99mTc is chemically bound to exametazime (HMPAO), the drug is able to cross the blood–brain barrier and flow through the vessels in the brain for cerebral blood-flow imaging. This combination is also used for labeling white blood cells (99mTc labeled WBC) to visualize sites of infection. 99mTc sestamibi is used for myocardial perfusion imaging, which shows how well the blood flows through the heart. Imaging to measure renal function is done by attaching 99mTc to mercaptoacetyl triglycine (MAG3); this procedure is known as a MAG3 scan. Technetium-99m can be readily detected in the body by medical equipment because it emits 140.5 keV gamma rays (these are about the same wavelength as emitted by conventional X-ray diagnostic equipment), and its half-life for gamma emission is six hours (meaning 94% of it decays to 99Tc in 24 hours). The "short" physical half-life of the isotope and its biological half-life of 1 day (in terms of human activity and metabolism) allows for scanning procedures which collect data rapidly, but keep total patient radiation exposure low. Diagnostic treatment involving technetium-99m will result in radiation exposure to technicians, patients, and passers-by. Typical quantities of technetium administered for immunoscintigraphy tests, such as SPECT tests, range from 400 to 1,100 MBq (11 to 30 mCi) (millicurie or mCi; and Mega-Becquerel or MBq) for adults. These doses result in radiation exposures to the patient around 10 mSv (1000 mrem), the equivalent of about 500 chest X-ray exposures. This level of radiation exposure carries a 1 in 1000 lifetime risk of developing a solid cancer or leukemia in the patient. The risk is higher in younger patients, and lower in older ones. Unlike a chest x-ray, the radiation source is inside the patient and will be carried around for a few days, exposing others to second-hand radiation. A spouse who stays constantly by the side of the patient through this time might receive one thousandth of patient's radiation dose this way. The short half-life of the isotope allows for scanning procedures that collect data rapidly. The isotope is also of a very low energy level for a gamma emitter. Its ~140 keV of energy make it safer for use because of the substantially reduced ionization compared with other gamma emitters. The energy of gammas from 99mTc is about the same as the radiation from a commercial diagnostic X-ray machine, although the number of gammas emitted results in radiation doses more comparable to X-ray studies like computed tomography. Technetium-99m has several features that make it safer than other possible isotopes. Its gamma decay mode can be easily detected by a camera, allowing the use of smaller quantities. And because technetium-99m has a short half-life, its quick decay into the far less radioactive technetium-99 results in relatively low total radiation dose to the patient per unit of initial activity after administration, as compared to other radioisotopes. In the form administered in these medical tests (usually pertechnetate), technetium-99m and technetium-99 are eliminated from the body within a few days. Single photon emission computed tomography (SPECT) is a nuclear medicine imaging technique using gamma rays. It may be used with any gamma-emitting isotope, including Tc-99m. In the use of technetium-99m, the radioisotope is administered to the patient and the escaping gamma rays are incident upon a moving gamma camera which computes and processes the image. To acquire SPECT images, the gamma camera is rotated around the patient. Projections are acquired at defined points during the rotation, typically every three to six degrees. In most cases, a full 360° rotation is used to obtain an optimal reconstruction. The time taken to obtain each projection is also variable, but 15–20 seconds are typical. This gives a total scan time of 15–20 minutes. The technetium-99m radioisotope is used predominantly in bone and brain scans. For bone scans, the pertechnetate ion is used directly, as it is taken up by osteoblasts attempting to heal a skeletal injury, or (in some cases) as a reaction of these cells to a tumor (either primary or metastatic) in the bone. In brain scanning, Tc-99m is attached to the chelating agent HMPAO to create technetium (99mTc) exametazime, an agent which localizes in the brain according to region blood flow, making it useful for the detection of stroke and dementing illnesses that decrease regional brain flow and metabolism. Most recently, technetium-99m scintigraphy has been combined with CT coregistration technology to produce SPECT/CT scans. These employ the same radioligands and have the same uses as SPECT scanning, but are able to provide even finer 3-D localization of high-uptake tissues, in cases where finer resolution is needed. An example is the sestamibi parathyroid scan which is performed using the Tc-99m radioligand sestamibi, and can be done in either SPECT or SPECT/CT machines. 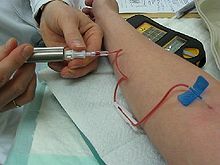 The nuclear medicine technique commonly called the bone scan usually uses Tc-99m. It is not to be confused with the "bone density scan", DEXA, which is a low-exposure X-ray test measuring bone density to look for osteoporosis and other diseases where bones lose mass without rebuilding activity. The nuclear medicine technique is sensitive to areas of unusual bone rebuilding activity, since the radiopharmaceutical is taken up by osteoblast cells which build bone. The technique therefore is sensitive to fractures and bone reaction to bone tumors, including metastases. For a bone scan, the patient is injected with a small amount of radioactive material, such as 700–1,100 MBq (19–30 mCi) of 99mTc-medronic acid and then scanned with a gamma camera. Medronic acid is a phosphate derivative which can exchange places with bone phosphate in regions of active bone growth, so anchoring the radioisotope to that specific region. To view small lesions (less than 1 centimetre (0.39 in)) especially in the spine, the SPECT imaging technique may be required, but currently in the United States, most insurance companies require separate authorization for SPECT imaging. Myocardial perfusion imaging (MPI) is a form of functional cardiac imaging, used for the diagnosis of ischemic heart disease. The underlying principle is, under conditions of stress, diseased myocardium receives less blood flow than normal myocardium. MPI is one of several types of cardiac stress test. As a nuclear stress test the average radiation exposure is 9.4 mSV which compared to a typical 2 view Chest X-Ray (.1 mSV) is equivalent to 94 Chest X-Rays. Several radiopharmaceuticals and radionuclides may be used for this, each giving different information. In the myocardial perfusion scans using Tc-99m, the radiopharmaceuticals 99mTc-tetrofosmin (Myoview, GE Healthcare) or 99mTc-sestamibi (Cardiolite, Bristol-Myers Squibb) are used. Following this, myocardial stress is induced, either by exercise or pharmacologically with adenosine, dobutamine or dipyridamole(Persantine), which increase the heart rate or by regadenoson(Lexiscan), a vasodilator. (Aminophylline can be used to reverse the effects of dipyridamole and regadenoson). Scanning may then be performed with a conventional gamma camera, or with SPECT/CT. In cardiac ventriculography, a radionuclide, usually 99mTc, is injected, and the heart is imaged to evaluate the flow through it, to evaluate coronary artery disease, valvular heart disease, congenital heart diseases, cardiomyopathy, and other cardiac disorders. As a nuclear stress test the average radiation exposure is 9.4 mSV which compared to a typical 2 view Chest X-Ray (.1 mSV) is equivalent to 94 Chest X-Rays. It exposes patients to less radiation than to comparable chest X-ray studies. Usually the gamma-emitting tracer used in functional brain imaging is 99mTc-HMPAO (hexamethylpropylene amine oxime, exametazime). The similar 99mTc-EC tracer may also be used. These molecules are preferentially distributed to regions of high brain blood flow, and act to assess brain metabolism regionally, in an attempt to diagnose and differentiate the different causal pathologies of dementia. When used with the 3-D SPECT technique, they compete with brain FDG-PET scans and fMRI brain scans as techniques to map the regional metabolic rate of brain tissue. The radioactive properties of 99mTc can be used to identify the predominant lymph nodes draining a cancer, such as breast cancer or malignant melanoma. This is usually performed at the time of biopsy or resection.99mTc-labelled isosulfan blue dye is injected intradermally around the intended biopsy site. The general location of the sentinel node is determined with the use of a handheld scanner with a gamma-sensor probe that detects the technetium-99m–labeled sulfur colloid that was previously injected around the biopsy site. An incision is then made over the area of highest radionuclide accumulation, and the sentinel node is identified within the incision by inspection; the isosulfan blue dye will usually stain any draining nodes blue. Immunoscintigraphy incorporates 99mTc into a monoclonal antibody, an immune system protein, capable of binding to cancer cells. A few hours after injection, medical equipment is used to detect the gamma rays emitted by the 99mTc; higher concentrations indicate where the tumor is. This technique is particularly useful for detecting hard-to-find cancers, such as those affecting the intestines. These modified antibodies are sold by the German company Hoechst (now part of Sanofi-Aventis) under the name "Scintium". When 99mTc is combined with a tin compound, it binds to red blood cells and can therefore be used to map circulatory system disorders. It is commonly used to detect gastrointestinal bleeding sites as well as ejection fraction, heart wall motion abnormalities, abnormal shunting, and to perform ventriculography. A pyrophosphate ion with 99mTc adheres to calcium deposits in damaged heart muscle, making it useful to gauge damage after a heart attack. The sulfur colloid of 99mTc is scavenged by the spleen, making it possible to image the structure of the spleen. Pertechnetate is actively accumulated and secreted by the mucoid cells of the gastric mucosa, and therefore, technetate(VII) radiolabeled with Tc99m is injected into the body when looking for ectopic gastric tissue as is found in a Meckel's diverticulum with Meckel's Scans. ^ The Tc-99 formed by decay of Mo-99 and Tc-99m during the time of the processing is removed, together its isomer Tc-99m, at the end of the manufacturing process of the generator. ^ "Tc-99m tables" (PDF). Nucleide.org. Laboratoire National Henri Becquerel. 2012-01-17. Retrieved 23 May 2012. ^ Segrè, Emilio; Seaborg, Glenn T. (1 November 1938). "Nuclear Isomerism in Element 43". Physical Review. 54 (9): 772. Bibcode:1938PhRv...54..772S. doi:10.1103/PhysRev.54.772.2. ^ Segrè, Emilio; Wu, Chien-Shiung (1940). "Some Fission Products of Uranium". Physical Review. 57 (6): 552. Bibcode:1940PhRv...57..552S. doi:10.1103/PhysRev.57.552.3. ^ "Brookhaven Graphite Research Reactor". bnl.gov. Retrieved 3 May 2012. ^ Richards, Powell (1989). Technetium-99m: The Early Days (PDF). BNL-43197 CONF-8909193-1. New York: Brookhaven National Laboratory. Retrieved 3 May 2012. ^ Tucker, W. D.; Greene, M. W.; Weiss, A. J.; Murrenhoff, A. (1958). "Methods of preparation of some carrier-free radioisotopes involving sorption on alumina". Transactions American Nuclear Society. 1: 160–161. ^ Richards, Powell (1960). "A survey of the production at Brookhaven National Laboratory of radioisotopes for medical research". VII Rassegna Internazionale Elettronica e Nucleare Roma: 223–244. ^ "The Technetium-99m Generator". Bnl.gov. ^ Richards, P.; Tucker, W. D.; Srivastava, S. C. (October 1982). "Technetium-99m: an historical perspective". The International Journal of Applied Radiation and Isotopes. 33 (10): 793–9. doi:10.1016/0020-708X(82)90120-X. PMID 6759417. ^ Stang, Louis G.; Richards, Powell (1964). "Tailoring the isotope to the need". Nucleonics. 22 (1). ISSN 0096-6207. ^ a b Herbert, R.; Kulke, W.; Shepherd, R. T. (November 1965). "The use of technetium 99m as a clinical tracer element". Postgraduate Medical Journal. 41 (481): 656–62. doi:10.1136/pgmj.41.481.656. PMC 2483197. PMID 5840856. ^ Sorensen, Leif; Archambault, Maureen (1963). "Visualization of the liver by scanning with Mo99 (molybdate) as tracer". The Journal of Laboratory and Clinical Medicine. 62: 330–340. PMID 14057883. ^ Harper, Pail V.; Andros; Lathop, K., C. (1962). "Preliminary observations on the use of six-hour Tc-99m as a tracer in biology and medicine". Argonne Cancer Research Hospital. 18: 76–87. ^ Harper, Paul. V; R.; Charleston, D.; Lathrop, K. (1964). "Optimization of a scanning method using Tc-99m". Nucleonics. 22: 54. ISSN 0096-6207. ^ Smith, E. M. (November 1964). "Properties, uses, radiochemical purity and calibration of Tc-99m" (PDF). Journal of Nuclear Medicine. 5 (11): 871–82. PMID 14247783. Retrieved 6 May 2012. ^ Smith, E. M. (April 1965). "Internal dose calculation for 99mtc" (PDF). Journal of Nuclear Medicine. 6 (4): 231–51. PMID 14291076. Retrieved 6 May 2012. ^ Eckelman, W. C.; Coursey, B. M., eds. (1982). Technetium - 99m : generators, chemistry and preparation of radiopharmaceuticals. Oxford: Pergamon. ISBN 978-0-08-029144-4. ^ Nuclear Consultants Inc (December 1966). "Injectable sodium pertechnetate 99mTc from your own compact production facilities" (PDF). Radiology. 87 (6): 36A. doi:10.1148/87.6.1128. ^ Arino, Hirofumi; Kramer, Henry H. (May 1975). "Fission product 99mTc generator". The International Journal of Applied Radiation and Isotopes. 26 (5): 301–303. doi:10.1016/0020-708X(75)90165-9. PMID 1184215. ^ Adler, Joseph J.; LaGuardia, Thomas (1994). "Decommissioning ALARA Programs Cintichem Decommissioning Experience" (PDF). ^ Botshon, Ann (2007). Saving Sterling Forest the epic struggle to preserve New York's highlands. Albany, NY: State Univ. of New York Press. p. 86. ISBN 978-0-7914-6939-2. ^ Committee on Medical Isotope Production Without Highly Enriched Uranium (2009). National Research Council of the National Academies (ed.). Medical isotope production without highly enriched uranium. Washington, D.C.: National Academies Press. ISBN 978-0-309-13039-4. ^ Karpeles, Alfredo; Palcos, María Cristina (1970). "Obtención de Generadores de Tc-99m" (PDF) (in Spanish). CNEA-267. Retrieved 6 May 2012. ^ "El Reactor RA - 1". CNEA.gob.ar (in Spanish). Archived from the original on 8 February 2012. Retrieved 26 April 2012. ^ Jamieson, Hugh, ed. (2006). The development of medical physics and biomedical engineering in New Zealand hospitals, 1945-1995 some personal overviews. Dannevirke, New Zealand: H.D. Jamieson. p. 14. ISBN 978-0-473-11900-3. ^ Jamieson, Hugh, ed. (2006). The development of medical physics and biomedical engineering in New Zealand hospitals, 1945-1995 some personal overviews. Dannevirke, New Zealand: H.D. Jamieson. p. 78. ISBN 978-0-473-11900-3. ^ Scheer, K. E.; Maier-Borst, W. (15 May 1963). "On the production of Tc99 m for medical purposes". Nuclear-Medizin (in German). 3: 214–7. PMID 13986994. ^ a b Wald, Matthew L. (July 23, 2009). "Radioactive Drug for Tests Is in Short Supply". New York Times. .
^ Smith, Michael (Feb 16, 2010). "Looming Isotope Shortage Has Clinicians Worried". MedPage Today. Retrieved Feb 25, 2010. ^ Ruth, Thomas (29 January 2009). "Accelerating production of medical isotopes". Nature. 457 (7229): 536–537. Bibcode:2009Natur.457..536R. doi:10.1038/457536a. PMID 19177112. ^ de Widt, Eric Jan (2010). "The High Flux Reactor in Petten resumes the vital roles of production of medical radioisotopes and nuclear research" (PDF). Tijdschrift voor Nucleaire Geneeskunde. 32 (4): 586–591. ISSN 1381-4842. Retrieved 27 April 2012. ^ Thomas, G. S.; Maddahi, J. (December 2010). "The Technetium Shortage". Journal of Nuclear Cardiology. 17 (6): 993–8. doi:10.1007/s12350-010-9281-8. PMID 20717761. ^ Raloff, Janet (2009). "Desperately Seeking Moly". Science News. 176 (7): 16–20. doi:10.1002/scin.5591760717. ^ "The Licensing for Decommissioning of Research Reactors in Indonesia of Research Reactors in Indonesia" (PDF). Iaea.org. Retrieved 26 April 2012. ^ "Centro Atómico Ezeiza". CNEA.gob.ar. Retrieved 26 April 2012. ^ "REAKTOR LVR-15" (in Czech). Retrieved 11 May 2012. ^ Beaver, J. E.; Hupf, H.B. (November 1971). "Production of 99mTc on a Medical Cyclotron: a Feasibility Study" (PDF). Journal of Nuclear Medicine. 12 (11): 739–41. PMID 5113635. ^ Guérin, B.; Tremblay, S.; Rodrigue, S.; Rousseau, J. A.; Dumulon-Perreault, V.; Lecomte, R.; van Lier, J. E.; Zyuzin, A.; van Lier, E. J. (April 2010). "Cyclotron production of 99mTc: an approach to the medical isotope crisis" (PDF). Journal of Nuclear Medicine. 51 (4): 13N–6N. PMID 20351346. Retrieved 11 May 2012. ^ Schaffer1, P.; et al. (2015). "Direct Production of 99mTc via 100Mo(p,2n) on Small Medical Cyclotrons" (PDF). Physics Procedia. 66: 383–395. doi:10.1016/j.phpro.2015.05.048. ^ Alary, Bryan (2 July 2013). "Cyclotron facility revolutionizes medical isotope manufacturing". University of Alberta. Retrieved 6 July 2013. ^ Lougheed, Tim (20 June 2013). "Cyclotron production of medical isotopes scales up". CMAJ. Ottawa: Canadian Medical Association. 185 (11): 947. doi:10.1503/cmaj.109-4525. ISSN 1488-2329. PMC 3735742. PMID 23798456. Archived from the original on 6 July 2013. Retrieved 6 July 2013. ^ Scholten, Bernhard; Lambrecht, Richard M.; Cogneau, Michel; Vera Ruiz, Hernan; Qaim, Syed M. (25 May 1999). "Excitation functions for the cyclotron production of 99mTc and 99Mo". Applied Radiation and Isotopes. 51 (1): 69–80. doi:10.1016/S0969-8043(98)00153-5. ^ Takács, S.; Szűcs, Z.; Tárkányi, F.; Hermanne, A.; Sonck, M. (1 January 2003). "Evaluation of proton induced reactions on 100Mo: New cross sections for production of 99mTc and 99Mo". Journal of Radioanalytical and Nuclear Chemistry. 257 (1): 195–201. doi:10.1023/A:1024790520036. ^ Celler, A.; Hou, X.; Bénard, F.; Ruth, T. (7 September 2011). "Theoretical modeling of yields for proton-induced reactions on natural and enriched molybdenum targets". Physics in Medicine and Biology. 56 (17): 5469–5484. Bibcode:2011PMB....56.5469C. doi:10.1088/0031-9155/56/17/002. PMID 21813960. ^ Moore, P. W. (April 1984). "Technetium-99 in generator systems" (PDF). Journal of Nuclear Medicine. 25 (4): 499–502. PMID 6100549. Retrieved 11 May 2012. ^ Dilworth, Jonathan R.; Parrott, Suzanne J. (1998). "The biomedical chemistry of technetium and rhenium". Chemical Society Reviews. 27: 43–55. doi:10.1039/a827043z. ^ Shaw, Ken B. (Spring 1985). "Worker Exposures: How Much in the UK?" (PDF). IAEA Bulletin. Archived from the original (PDF) on 5 September 2011. Retrieved 19 May 2012. ^ Eckelman, William C.; Richards, Powell (December 1970). "Instant 99mTc-DTPA" (PDF). Journal of Nuclear Medicine. 11 (12): 761. PMID 5490410. Retrieved 21 July 2012. ^ Molinski, Victor J. (1 October 1982). "A review of 99mTc generator technology". The International Journal of Applied Radiation and Isotopes. 33 (10): 811–819. doi:10.1016/0020-708X(82)90122-3. ^ International Atomic Energy Agency (2008). Technetium-99m Radiopharmaceuticals: Manufacture of Kits (PDF). Vienna. ISBN 9789201004086. Retrieved 2012-07-21. ^ Schwochau 2000, p. 414. ^ Squibb, B.-M. "Cardialite kit for the preparation of Technetium 99m Sestamibi for injection, Prescribing information, April 2008" (PDF). Food and Drug Administration. Retrieved 2009-09-03. ^ "Neurolite (bicisate dihydrochloride)". National Institutes of Health. Retrieved 2009-11-11. ^ Bedetti, G.; Pizzi, C.; Gavaruzzi, G.; Lugaresi, F.; Cicognani, A.; Picano, E. (2008). "Suboptimal awareness of radiologic dose among patients undergoing cardiac stress scintigraphy". J Am Coll Radiol. 5 (2): 126–31. doi:10.1016/j.jacr.2007.07.020. PMID 18242529. ^ Fahey, Frederic H.; Treves, S. Ted; Adelstein, S. James (1 August 2011). "Minimizing and Communicating Radiation Risk in Pediatric Nuclear Medicine" (PDF). Journal of Nuclear Medicine Technology. 52 (8): 1240–1251. doi:10.2967/jnumed.109.069609. ^ Gershenwald, J. E.; Ross, M. I. (2011-05-05). "Sentinel-Lymph-Node Biopsy for Cutaneous Melanoma". New England Journal of Medicine. 364 (18): 1738–1745. doi:10.1056/NEJMct1002967. ISSN 0028-4793. PMID 21542744. ^ Diamond, Robert; Rothstein, Robin; Alavi, Abass (1991). "The Role of Cimetidine-Enhanced Technetium 99m-Pertechnetate Imaging for Visualizing Meckel's Diverticulum" (PDF). The Journal of Nuclear Medicine. 32 (7): 1422–1424. Atomic Energy of Canada Limited (1997). Canada enters the nuclear age a technical history of Atomic Energy of Canada Limited. Montréal: McGill-Queen's University Press. ISBN 978-0-7735-1601-4. Retrieved 18 April 2012. Emsley, John (2001). Nature's Building Blocks: An A-Z Guide to the Elements. New York: Oxford University Press. ISBN 978-0-19-850340-8. Hoffmann, Darleane; Ghiorso, Albert; Seaborg, Glenn T. (2000). "Chapter 1.2: Early Days at the Berkeley Radiation Laboratory" (PDF). The Transuranium People: The Inside Story. University of California, Berkeley & Lawrence Berkeley National Laboratory. ISBN 978-1-86094-087-3. Litt, Paul (2000). Isotopes and innovation MDS Nordion's first fifty years, 1946-1996. Montreal: McGill-Queen's University Press. ISBN 978-0-7735-2082-0. Retrieved 18 April 2012. National Research Council (2009). Medical Isotope Production Without Highly Enriched Uranium. National Academies Press. ISBN 978-0-309-13039-4. Rimshaw, S. J. (1968). Hampel, Cifford A. (ed.). The Encyclopedia of the Chemical Elements. New York: Reinhold Book Corporation. Schwochau, Klaus (2000). Technetium: Chemistry and Radiopharmaceutical Applications. New York: Wiley. ISBN 978-3-527-29496-1. Wikimedia Commons has media related to Technetium-99m. Iturralde, Mario P. (1 December 1996). "Molybdenum-99 production in South Africa". European Journal of Nuclear Medicine. 23 (12): 1681–1687. doi:10.1007/BF01249633. Hansell, Cristina (1 July 2008). "Nuclear Medicine's Double Hazard: Imperiled Treatment and the Risk of Terrorism" (PDF). The Nonproliferation Review. 15 (2): 185–208. doi:10.1080/10736700802117270. Retrieved 24 May 2012.